Fr Epeli Qimaqima began his role as Vocations Director on 1 June 2015. He is originally from Fiji and is the eldest of four children. He migrated to Australia to work as a primary school teacher in 2002. 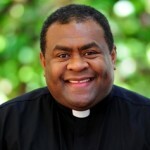 During his teaching years in Sydney, his sense of the call to the priesthood took on a new phase; this was through his involvement with the families from the school, the Fijian community, the faith of the students, and the joy of the priests who worked at the school. He entered the seminary in 2006 and was ordained a priest on 4 August 2012 in St Mary’s Cathedral, Sydney, with seven others. He is also Administrator of St Benedict’s Parish, Broadway.